Extract and Convert Microsoft Outlook Email: Embedded E-Mail Processing: How to Convert Outlook Email With Email File Attachments to PDF? Embedded E-Mail Processing: How to Convert Outlook Email With Email File Attachments to PDF? MessageExport is a professional tool designed specifically for people who have important work to do with E-Mail. It integrates tightly with Microsoft Office Outlook, enhancing the user experience with powerful new features designed to make their work life easier and more productive. Today we released MessageExport 3.5, and we're excited about the new features it has. One feature was requestd by several customers was to improve MessageExport's handling of .msg and .eml email file attachments (emails within emails). In this release, we've improved how MessageExport handles E-Mail file attachments that are themselves E-Mails during the process of converting (or bulk converting) E-Mails to PDF. Say that you are working on a legal case, and you have just received a "smoking gun" E-Mail message as part of discovery. This E-Mail that has a .MSG E-Mail file attached to it. And inside that .MSG E-Mail attachment, is another E-Mail message, that contains yet another .MSG E-Mail file attachment. And lets also say that each of these E-Mails contain other attachments, such as .jpg images. If you are the lucky person who is responsible to convert this E-Mail message (which is actually four different nested E-Mails) into a PDF file, it may take you 30 minutes or longer to manually disassemble the entire E-Mail and attachments, re-organize them into a logical structure that preserves their context, and then convert them all into a single PDF file. MessageExport 3.5 Exports E-Mails That Are Attachments Into PDF Files. Or, you could just click on the main E-Mail message, choose "Export to PDF" from the MessageExport toolbar, and click "Export." MessageExport will complete the entire E-Mail to PDF operation for you in less than a minute, including the processing of emails that are themselves forwarded email attachments. MessageExport 3.5 also includes a re-vamped naming structure, which we call Breadcrumbs" for lack of a better term. Breadcrumbs help to orient the viewer to the content within the PDF. For example, it may be important to know the order and the structure of the various E-Mails, otherwise how can you tell who sent which file to whom? Embedded email processing is a powerful new feature for MessageExport. We hope it will help make you more efficient, and your work more delightful. If you are already a MessageExport customer, you may be entitled to free upgrade. If you have never tried MessageExport, take it for a 15 day spin. If it meets your needs, we'd love to have you as a customer. 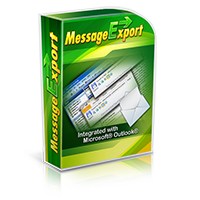 Click here to download a free trial of MessageExport.